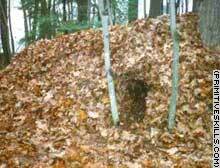 Maine Primitive Skills School says the walls of the shelter should be about 2-feet thick -- good enough to for a mild night. (CNN) -- Knowing how to put together a simple protective structure could save your life in an emergency, even in a day hike gone bad in a forest or national park. • Find a high dry area to avoid water problems during a storm. • Locate a strong ridge pole as an anchor for the hut. • Place sticks as ribbing along both sides of the ridge pole. • Pile dry debris inside to lift the camper off the cold or damp ground. • Make walls steep for shedding water. • Four forked sticks can roof off the entryway. • Additional debris should be piled on thick and high for protection. • The finished hut should have walls about 2 feet thick, good for a mild fall night.